Experiencing Boris Bakal’s satirical city tour. 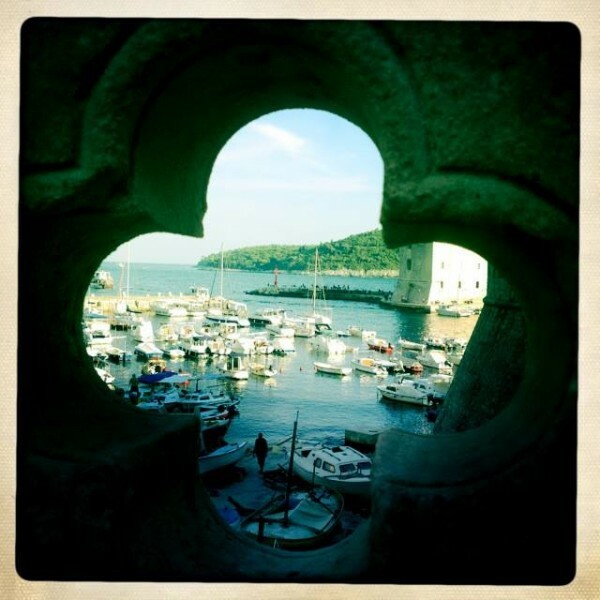 For those of us who grew up in Yugoslavia, Dubrovnik has always had a special kind of magic. Though most of us will have at least one or two of the same kind of holiday snapshots in our family albums – feeding the pigeons by the Onofrije’s fountain, posing on one of the staircases towering over Stradun, eating a massive ice cream or strumming a guitar against the backdrop of shiny white stone and crystal clear blue sea – our personal memories of the place would always be invested with a sense of uniqueness and a specific kind of nostalgia. Some have made friends for life, fallen in love or had their heart broken here for the first time – but most have taken away with them some unforgettable memory. The very first time I have ever seen the sea was by the walls of the old city. I was three years old, we had driven from Serbia through Bosnian mountains in a yellow 2CV, my parents in the front, me and Katica (my imaginary friend) at the back. We were received in the old city with maternal warmth and extraordinary house pride by a woman who had been my father’s landlady when he was a student. As we sank into cool white sheets behind the thick walls that night, I remember feeling that it was all indeed nothing short of a fairy-tale, and no other summer holiday thereafter ever came quite close to that. Many things have however changed radically since then, not least the fact that the city was shelled and heavily traumatized during the cannibalisation of Yugoslavia in the early 1990s – the first time in its centuries-long history that it ever suffered any military damage. And since then worldwide cruisers have found their way into the city too. There is a palpable kind of neurosis you find among the citizens of Dubrovnik nowadays, who seem as though they’ve had enough, riding on overcrowded local buses, wheeling their worn out supermarket bags around idle thrill-seekers, selling trinkets and day trips in mid-day heat on some measly commission, cursing under their breath. According to one statistic, in 1955 there were 15,000 people living inside the city walls. Since the invasion of foreign investors in search for holiday homes in the last 15 years, this number has dwindled to less than 700. In winter time, when the show is over and all the cruisers have departed, Dubrovnik becomes a ghost town. It is no wonder then that when the new Dubrovnik Summer Festival artistic director Krešimir Dolenčić took over the annual event in its 64th year of existence, he made it part of his mission to return the soul to the city. This was also the brief that director Boris Bakal (co-founder and leader of the multimedia platform Shadow Casters) received when he was approached to create a piece for this year’s programme. Bakal’s commission was appropriate, though somewhat unusual in a number of ways. Traditionally, much of the theatre, music, dance and film repertoire of the Dubrovnik Summer Festival takes place in outdoors venues so site-specificity has been a major feature of the festival programming since its beginnings in 1950. However, the city’s Renaissance/ Baroque ambient seems to have always predetermined the programming in favour of the classics – Shakespeare, Goldoni, Moliere and Dubrovnik’s own playwright Marin Držić (1508-1567) forming the core of the repertoire. In its six decades of existence international artists have taken part too, including Helene Weigel, Peter Brook and even, more recently, Jan Fabre. Bakal’s own work has been truly international too, especially since the early 1990s when he left Croatia to work in Italy, Belgium and Austria, eventually reaching the US too. However, his output, characterized by an interest in non-building-based performance, has often been closer to artistic activism, even when it is initially inspired by a classic text. Shadow Casters’ trilogy Process_City, for example, created between 2004-2008, was loosely inspired by Kafka’s The Trial, but mostly motivated by a desire to radically challenge the existing critical reading of the text as being about victimhood, in favour of personal agency. Bakal’s satirical city tour/promenade performance around Dubrovnik – named Father Courage in a paraphrase of the title of Brecht’s famous classic – is, as pointed out by one of the local reviewers, a kind of Shadow Casters’ ‘best of’. In keeping with Bakal’s previous work, this too is a project driven by a desire to wake up and activate the audience in relation to its everyday reality. This tour is consequently aimed predominantly at the locals, inviting them to participate in a creation of new urban myths. Initially declared ‘dead’ at the beginning of our journey, we are equally arbitrarily declared ‘alive’ again at its end. Whether or not anything has fundamentally changed in this process is entirely up to us – and this is perhaps where the theme of courage ultimately resides. According to Bakal, what connects Brecht’s Mother Courage and his own Father Courage is the question of survival. Mother Courage loses everything in order to survive, she is a conformist, a ‘parody of courage’, claims the director. Father Courage is Dubrovnik itself, who must make his own choices. The five chosen locations are populated with the total of 14 performers (including the show’s designer Leo Vukelić) who have collecively devised the content of the piece. Five of them – Goran Bogdan, Ivana Krizmanić, Jelena Lopatić, Zrinka Kušetić and Silvio Vovk – are the ‘guides’ while the others remain in each location as the ‘place keepers’. Lasting for over three hours, the five simultaneous stories snake up and down the stairs and through the narrow passageways of the city knitting together intimate confessions, facts, fictions and occasional jokes. Theoretically the audience could choose to follow one of the guides or to stay for the duration of the performance in a single location, thus being given at least 10 potential narrative journeys through the piece (although the latter option would inevitably result in some repetitiveness and perhaps fatigue with the seemingly trivial nature of some of the protagonists’ conflicts). I managed three different journeys between the dress rehearsal and the final night, thus witnessing different strategies the guides had taken in tackling the format and the thematic content of the piece. Eye-candy and TV star Goran Bogdan had chosen to fuse the story of his lost love Cvijeta of Dubrovnik, with the story of a historical figure, a Dubrovnik poetess and salonniere Cvijeta Zuzorić (1552-1648), within a format of a guided city tour. Elfish and thoroughly enticing Jelena Lopatić, on the other hand, takes the concept of our shared experience of being dead for the duration of the show as her departure point and turns her journey into a series of joyous and touching farewells with her beloved family members, played by the audience as unsuspecting stand ins. Though it was not unusual for some uninitiated sleep-deprived residents to heckle the performers through their open windows on account of the ‘accuracy’ of their utterances, Lopatić’s routine also had a nice touch of generosity towards them – such as collecting some cigarettes from the audience members into an envelope and posting them en route through the letterbox of an impoverished local resident called Koke, who she had got to know in the course of her research. While Bogdan’s journey was probably the most entertaining, Lopatić’s was simply the most moving in its humanity. However, it was Ivana Krizmanić’s tale that I found narratively the most satisfying. Ultimately though, for those who see it, the show has the capacity to adorn the city with a whole new collection of mental snapshots and lyrical imagery: a glimpse of the starry summer sky as you lie on a camp-bed in Sponza, some white laundry air-drying gently in your view, a dance in the square, a marriage proposal by the statue of a peeing lady, a lovers’ bed under the palm leaves in the Jesuits’ church courtyard, a chance to leave your own love message to the city on a mortar wall discovered by this show… It’s a kind of experience that makes you see differently, or a kind that, by taking you off the beaten track, perhaps just makes you see – through your own eyes, like a child again, the simple unspoiled beauties of a place.